As innovation and technology continues to grow, so do people’s expectations as to how they wish their homes to look. People are looking to upgrade to that modern home look. Whether it be through moving house to a new build, in which many use these pallets in order to do so. Or simply modifying your current property. Here we cover things you can do to give your home that new upgraded modern feel. A large number of modern homes have now moved to open-plan living. This concept is very popular, in which it integrates the areas such as the kitchen, living room and dining area. This will give your home that modern and trendy look. However there are downsides, such as it resulting in heating costs increasing. Therefore before moving to this it is important to take this into account. Some of the walls may also be structural, so it could be difficult to simply move them. Another way of modernising your home is increasing the amount of glass in it, which will also increase the natural light coming into your home. This will give it that natural, spacious, modern look. This could be through the usual windows or even a glass door. This also leads on to standing out, in which a good way of doing this is adding more bold colours into your living space. This could be through coloured sofas or cushions for example. Drawing on the living space, many are now using ‘clever furnishings’, to provide an open look to their homes. This is through folding sofa beds or even desks, which can be easily folded away. This provides a fantastic way of increasing open space and thus giving your home that increased modern look. 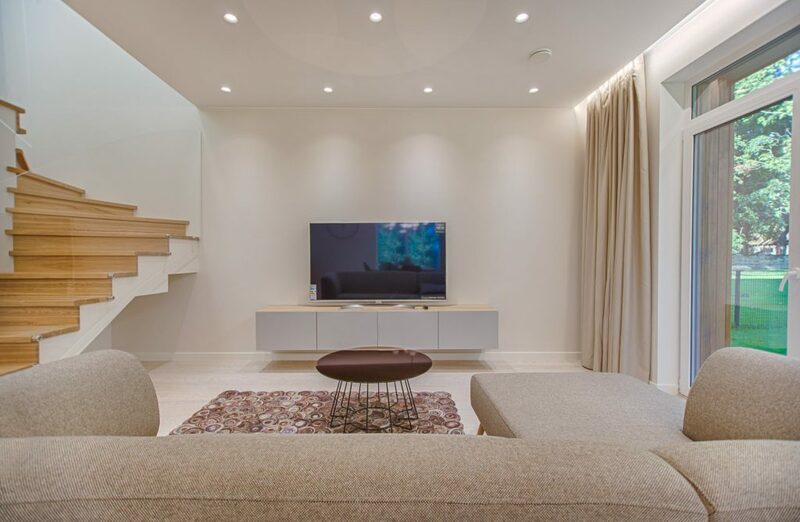 Another popular way of modernising your home is increasing artificial lighting. There is little doubt that many old and outdated homes do have that dark and gloomy look to them. Therefore increasing both artificial and natural light into your home is very important. Bathrooms are normally one of the last things people look to modify in their homes. However, it is certainly growing interest, and a well-designed modern bathroom will certainly go a long way to increasing the value of your home, whether this be for a potential buyer. The final point is not only looking to change the inside but also the outside of your home. This can be done through adding colour as well as giving the home that visual balance with added plants.